Use the EZ-LIFT magnetic lifters to move plate steel, block or round steel, and iron material in your shop. Super-powerful "rare earth" neodymium iron boron magnet requires no electricity to perform material lifting. 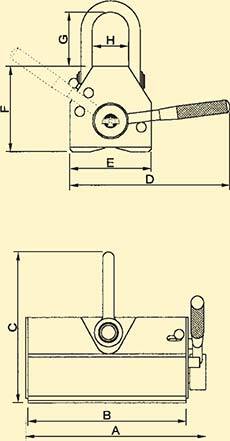 It’s perfect for loading or unloading most workpieces including press molds, plastic molds, machined parts, etc. 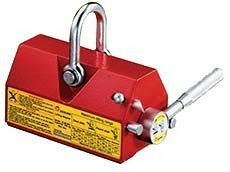 Lifting Magnets rated for loads up to 6,600 lbs. "Rare Earth" lifting magnets tested to hold 3.5 TIMES the rated load for maximum safety. Eliminates dangerous straps and slings. Fast, safe & efficient material lifting, loading, and unloading. First center the lifting magnet on the material. Then, simply move the lever to the “ON” position to engage the lifting magnet.